This Dutch release was issued a decade ago. It is essentially a repro of the Piltdown Men album from the sixties. 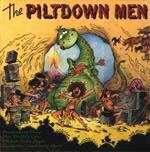 The Piltdown Men were not only a hoax scientifically, they were a studio concoction as a band. The brain child of Ed Cobb (legendary producer of the Standells and the Chocolate Watchband) and Lincoln Mayorga (jazz heavy - Charles Lloyd, etc.). Some creative inventive tracks, some studio filler. This Thom Starr & the Galaxies tune is most familiar from the Challengers sessions. It's faster here, and more infectious, with an amply modernized Paul Johnson swirly guitar sound. Solid and fun. Another original for the Nitros, this is fast and furious, sorta Mission Impossible-ish, with swank reverb. Chunky, thumpy, and shredding double picked leads in the break a la the Dickster. This original is from the pen of guest guitarist Mike Sobieski. The style is quite Euro-instro, like a surfified Shadows. A melodic, twangy, and very enjoyable mid tempo number. This is a more guitar oriented track than most Piltdown Men sessions. It's also more melodic. The lead guitar employs a shimmering vibrato, and the rhythm is infectious. It's not very surfy, but would sandwich between a couple of surf tracks easily enough. It's relatively MOR, but good listening. Simple sax backing, and a fluid sound. This is a Henry Mancini tune. A fast and pummellicious instro that reminds me of 409 melodically. The guitars are lock-syncked with the drums in a cool rolling cadence, with a restrained but effective energy. Really nice arrangement. Tribal toms, chunky delivery, and too much fun. The feet, they just keep a-moving. The Snow Men (a.k.a. The Sunrays) cut this as a single on Challenge a millennia ago. The Nitros have cleaned it up, and given it more power. I've always liked the original, and it's nice to see that it can be really pumped out. fast, precise, tribal, and very infectious. When the Lively Ones did this, they titled it Hotdoggen. They made it ring and roll. The Nitros keep the ringing tone, but add chunk. Clean, and very reverent. This country classic has been garaged into submission, twanged into twilight. Wish I could place the name of it, but it escapes me now. Anyway, it's a fun party kinda hoedown. This band has grown a lot. Their early few-and-far-between tracks were unmelodic and mere progressions, but this has a nice surf feel, a simple but effective melody, and twangy thin surf guitar sound. This is a moody track, a little brittle sounding, but entertaining and solid. High spirited, almost King of Hawaii like in melody structure and pacing. This is a spectacular track. It is infectious, pristine, melodic, and very fun. It has a kinder-gentler Cruel Sea break, a divine friendliness, and a full round sound. The whammy dips are cool, and any would proud to have created this. Absolutely great! A Mickey Baker tune, slurried out with a grodie fifties instro sound. Progression driven, and frat energized. This is an original tune, swimming in Spanish whammy, like Pintor with lake wake rippling at it's toes. Melodic, pretty, and very enjoyable. The imagery is quite strong, Castilian pictures of bulls and black lace, and sangria all around. Really nice, with ringing tones from the guitars.